5 Comments	This post may contain affiliate links. 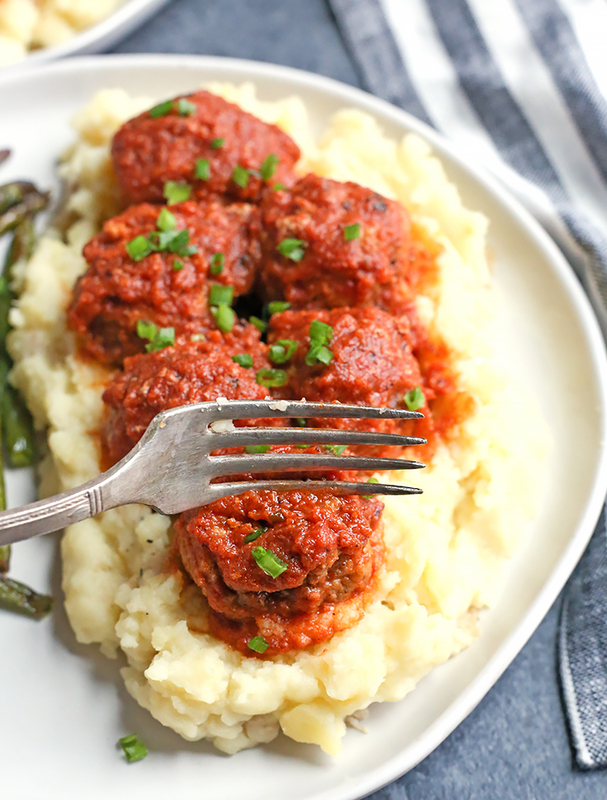 These Paleo Whole30 Barbecue Meatballs are made in the Instant Pot which makes the quick and juicy. 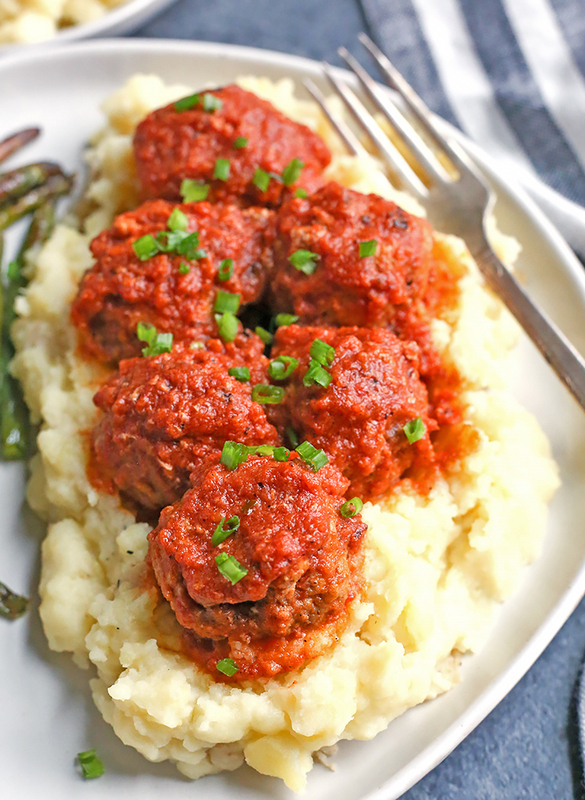 They are cooked in a homemade barbecue sauce that is flavorful and easy. Gluten free, dairy free, nut free, egg free, and low FODMAP. I realize this looks like meatballs and marinara, but that’s because the sauce is homemade so It’s probably not as thin as traditional sauce. These cook for only 9 minutes!! Yes, there is some more time involved in mixing and rolling them, but it’s not bad. I needed to come up with a low FODMAP barbecue sauce since store bought is not an option. I used pineapple juice as a sweetener and it worked great. It’s not overly sweet and it has a nice tang. Of course garlic oil for flavor as always. It comes together quick and I will definitely be making it for more recipes. You can make this ahead and store it in the fridge so it’s ready on the night you make these, making them super quick! If you don’t need it low FODMAP you can use this Paleo Whole30 Barbecue Sauce or store bought like Primal Kitchen. 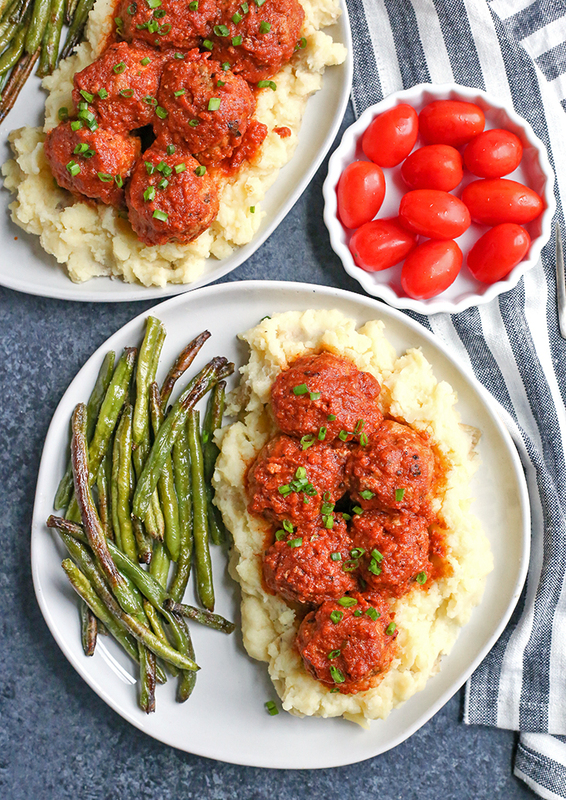 Meatballs usually have a egg and some almond flour in them, but I know a lot of people are egg free or nut free so I wanted to make these doable for everyone. I use some grass-fed gelatin as a binder. Just sprinkle it evenly over the meat and mix well and it really helps hold them together. Some barbecue sauce and coconut aminos are added for moisture and flavor. If you don’t have gelatin and don’t have a nut or egg sensitivity then you can use 1 egg and 1/4 cup almond flour in the meat. I made these twice in the same week to try out different meats. The first time I used ground turkey (pictured) and I thought they tasted great, but my husband thought they were a little dry. I made them again with beef and he liked those way more. So it’s personal preference what meat you use, either will work! I served them over Whole30 mashed potatoes which I highly recommend and some air fried green beans. 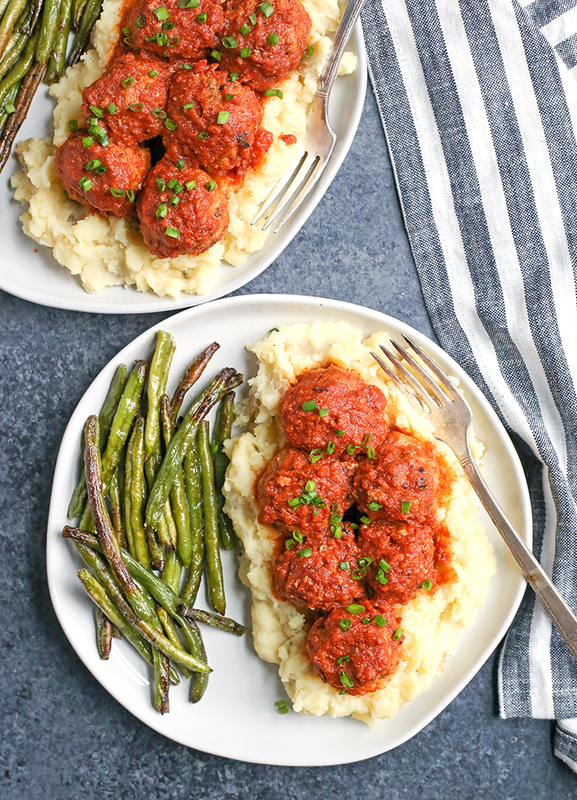 A total comfort food meal! 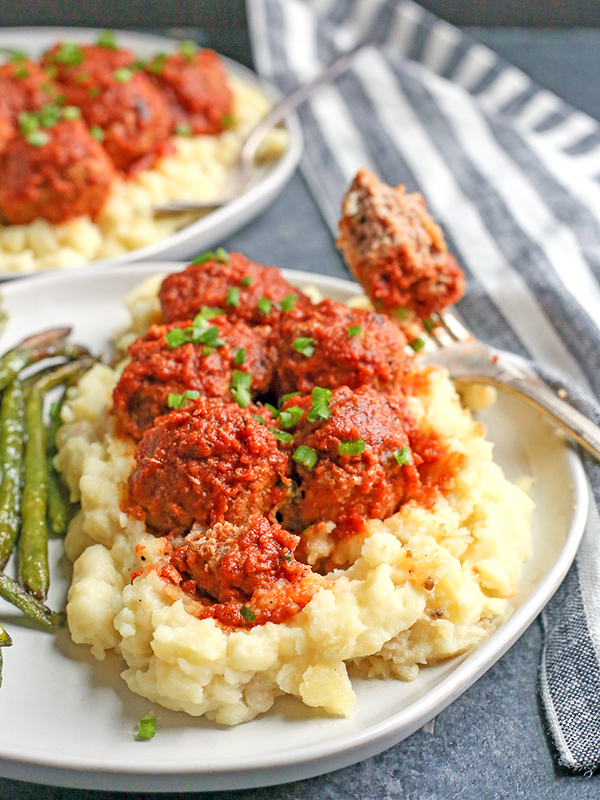 This is the first time I’ve made meatballs in the Instant Pot and I love it. It definitely won’t be my last and I think you’ll love it as well. It’s quick and they come out perfect. Enjoy! Make the barbecue sauce. In a medium sauce pan, combine all the ingredients and cook 15 minutes. Turn off the heat and blend with an immersion blender and cook another 5 minutes or until desired consistency. Make the meatballs. In a large bowl, combine meat, salt, barbecue sauce, coconut aminos, and salt. Mix well. Sprinkle gelatin evenly over mixture and mix well until there are no dry spots. Add in the chives and mix again. Roll the meat into about 22-24 meatballs. I like to divide the mixture in half and make 11-12 meatballs per pound. They should be about 1.5 inches thick. 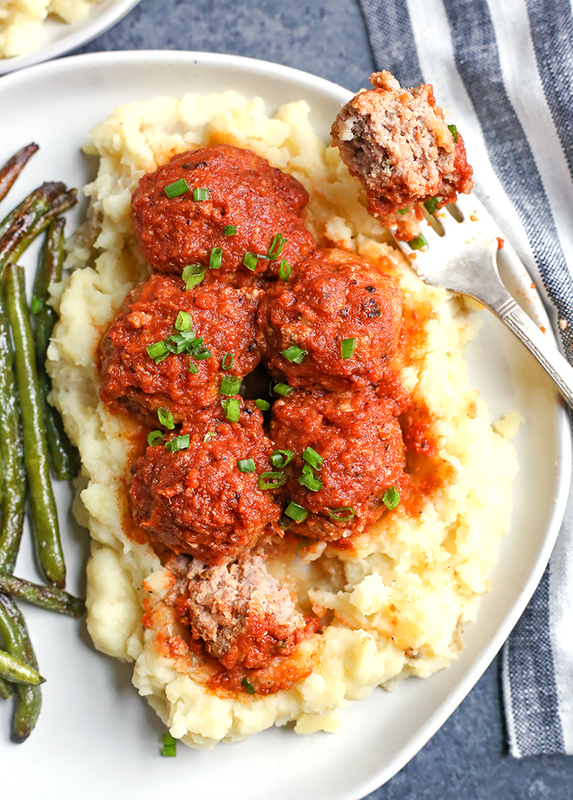 Place 1 cup of barbecue sauce in the bottom of the Instant Pot, top with the meatballs and cover with another 1 cup of sauce. You should have 1 cup of barbecue sauce remaining that you can use for another recipe. Place the lid on, make sure the valve in closed and cook for 9 minutes on high. Hit "cancel" and release the pressure. Remove the meatballs, hit the "sauté" button and cook the sauce down for 15 minutes, stirring regularly, to thicken. Add the meatballs back in, hit "cancel" and serve warm. 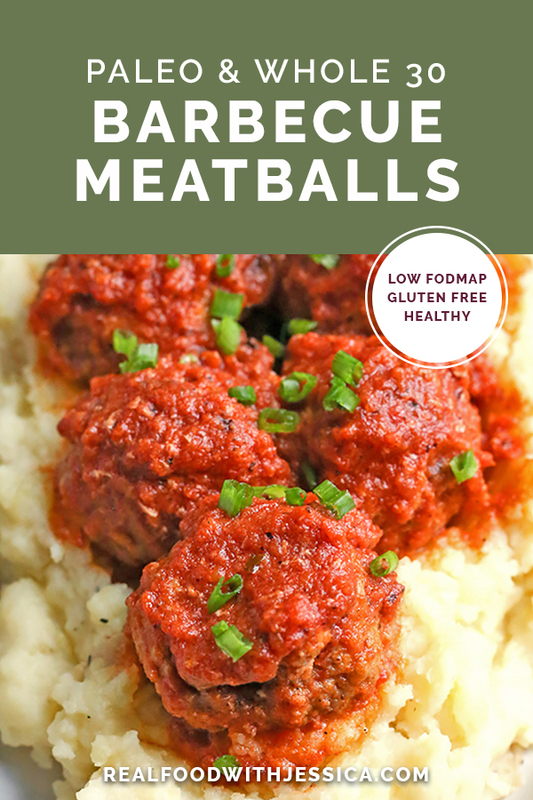 *If you don't need these low FODMAP then you can use a Whole30 Barbecue Sauce like Primal Kitchen which will make these even easier. **I'm sure these can be baked in the oven. I haven't tried it yet, but would say 350° for 20-25 minutes. These look great, thank you for sharing your recipe. I am going to try it this weekend. You’re welcome! Hope you love them, April! Hi Christine- 1 egg and 1/4 cup almond flour.